See a whole year in a glance. You simply look for the drydays ( ) to plan your event. 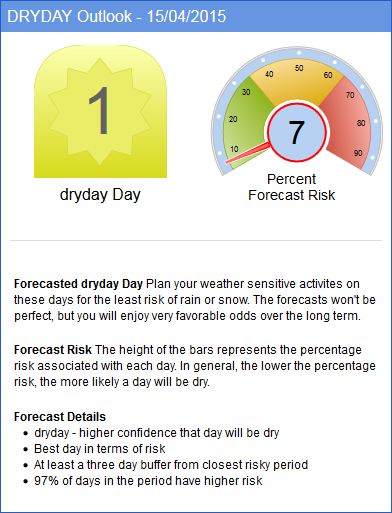 A dryday is a day with a lower chance for rain than the other days. Days without sun symbols are weaker days in the month where a storm can come into the area. It does not mean that it will rain or snow, just that there is a risk of rain or snow. These Risky Days are then designated as having a moderate risk of rain ( ) or having a high risk of rain ( ). The best approach, when picking a single dry day, is to pick a day in the middle of a group of drydays and away from high risk days. Unlike other weather forecasts our forecasts do not change. 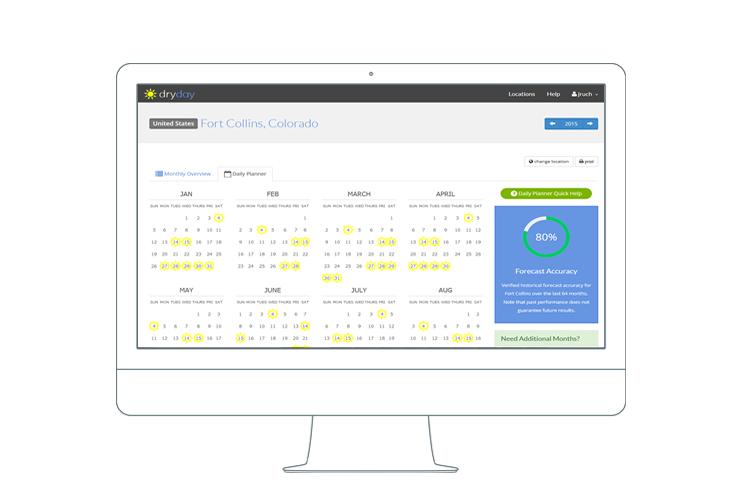 A dryday ( ) forecast for 18 months from now has the same expected accuracy as the forecast for tomorrow. While the calendar was created for a quick reference, the bar graph is a detailed analysis of the forecasted month. Each day is rated according to the risk of rain or snow. Further details and explanations are available by hovering over a particular day in the bar chart. All of our dryday forecasts have published verified historical accuracy in the calendar planner. Sharing is a feature that allows you to easily share a single month for a single location. It is as easy as printing a forecast. Sharing is limited to five per month. If you want to share more, (i.e. 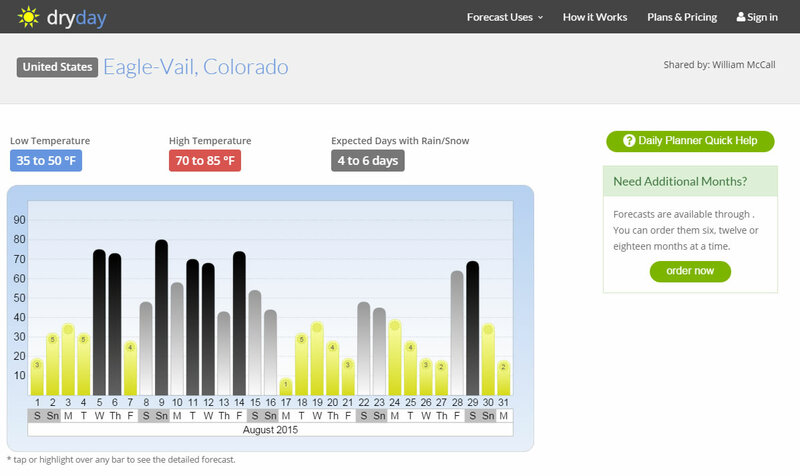 send a month's forecast to everyone in your office or family) just send us an email. 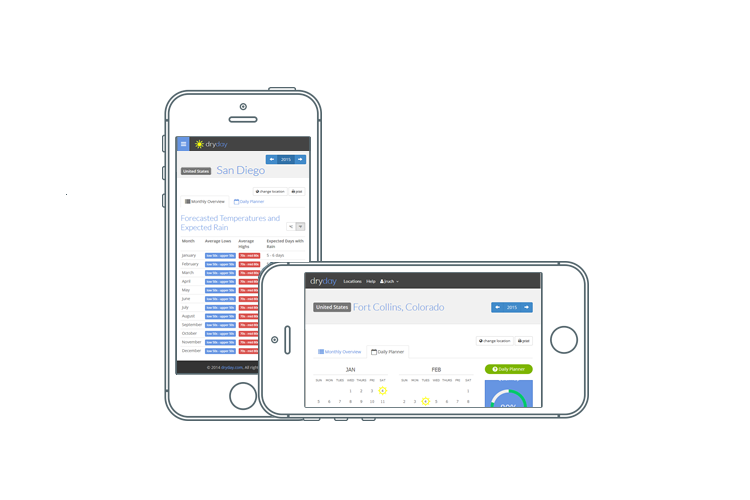 dryday weather planning is available from virtually any device. 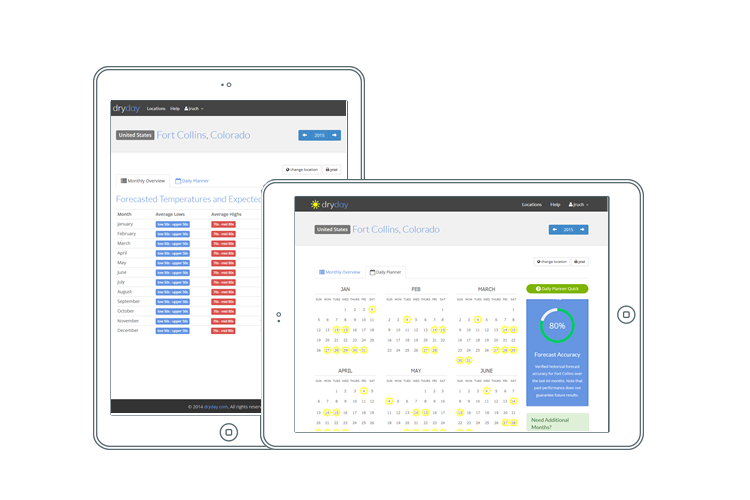 Find verified long-range temperature and dryday forecasts for over 3.2 million locations worldwide. You guys were spot on in April. The seven day forecast on the news was showing rain up until the day before our company picnic. The day ended up perfect. Thanks again. Wonderful. Had we planned our Disneyland trip a week earlier, it would have rained on us. Great Service! Helped end the debate on which weekend worked for everyone real quick. Only one weekend in November was surrounded by sunny days. A sunny day for a 4 year olds birthday party. Thank you. My daughter’s wedding was worth every penny. I am just thankful my wife talked me into purchasing your forecast. Using your forecast we picked the one weekend in October that it did not rain. Simple to use with refreshingly great service. Reserving a campsite for the upcoming season has always been a gamble. Thanks for giving me something solid to go off of. I like that we can compare several locations. Company picnic worked out just fine. Thanks for the assistance. dryday completely set my mind at ease when planning my outdoor wedding. I heard many horror stories of outdoor weddings ruined from an unexpected rainfall. I knew that the weekend I chose was going to be a nice sunny dry day and because of that our wedding turned out perfect! Quick and practical planning assistance, very useful. Thanks for the help. Your customer service has been awesome. Will definitely tell my friends. I had purchased your forecasts already for my business and then used it to plan my wife’s family reunion. Everyone was worried when it got close as the weatherman swore it was going to rain. But just like you predicted, we had a beautiful sunny day. Every other forecasts just seems to change every day. Yours is the only one that allows me to order what I need, two months ahead of time.